Anyone new to lure fishing might wonder about some of the terms used on these pages and elsewhere. Here is my list of definitions that will help to explain what I mean when I use those terms. Illustrations are used where I think they might help. When considering lure types remember that many lures can be used in more than one way and some lures do not sit easily in just one category, often a lure type is described in relation to how it is being fished, for instance the Bomber long 'A' is a minnow, but I might say "The Bomber Long 'A' is a good jerkbait", because if it is jerked it has a good action and catches pike. It is confusing sometimes but it is not worth arguing about the finer points of lure definitions. If anyone has any major disagreement with anything here or wants to point out any omissions please let me know, I do not expect this article ever to be really finished, it should grow as lure fishing techniques develop. In alphabetical order. Alphabet plug A plug like a "Big 'N'", "Big 'S'", "Big 'O', etc. Usually quite buoyant and in size ranges from about 1" to 3". I think the "Big 'N'" by Bill Norman (hence the 'N') lures was among the first, they were originally designed for freshwater bass fishing in the U.S.A.
Bait Any lure, but usually applied to bigger lures designed for pike. Bar spinner Or just plain spinner. The basic "Mepps"-type lure with a spinning blade mounted on a central wire shaft with a clevis, a drilled weight and a treble hook at the back. From tiny ultra-lite 1/8 oz versions up to 2oz monsters. There are many variations on the basic theme, some have a single hook for fishing through weed or for some species of fish better hooked on singles, some have two (or more) blades, the blades vary immensely in shape from "Colorado" to "willowleaf", the hook or sometimes hooks, can be dressed with "bucktail" or a soft rubber fish or grub. Some bucktails designed for muskie and pike are over 10" long with all the dressing. Blade The rotating, shaped, flat metal component of spinners and spinner baits. In a vast range of sizes, shapes, gauges and colours. Blade bait Any spinner or spinnerbait with a rotating blade. Braid Modern braided line usually largely consisting of "Spectra" fibres. These lines are very strong for their diameter with very low stretch and they are ideal for most lure fishing applications. Bucktail Literally the tail fur from a buck (a deer). Used as a dressing on trebles and singles to add bulk and attraction to a lure. The term is also frequently used to describe a large spinner with a dressing of bucktail. Buzzbait This might mean one of two things, normally a type of spinnerbait with a prop blade designed to be fished quickly across the surface, or sometimes an inline spinner with a prop blade instead of a normal blade. a blade to a spinner shaft. Colorado blade basic rounded blade mainly used on spinnerbaits. Crank To simply retrieve a lure by winding (=cranking) the reel handle, as opposed to using rod movements to impart extra action. Crankbait Plug, usually with a diving lip, originally designed to be retrieved with a steady crank. Crawler Surface lure that appears to be crawling across the water surface on a steady retrieve. Fluted Blade Type of spinner blade, supposed to reflect more light. Similar to an Indiana blade in shape. Glider Type of jerkbait that glides from side to side in a zig-zag fashion on alternate strokes of the rod. Indiana Blade Type of spinner blade, longer than a Colorado blade. Type of spinner blade, requiring no clevis. In-line spinner Any spinner simply mounted on a central shaft, to differentiate it from a spinnerbait. Sometimes refers specifically to a type of spinner that has a specially shaped in-line blade requiring no clevis. Jerk Fast and powerful stroke of the rod used to impart action into a jerkbait. Jerkbait Any plug that has to be have its action imparted by rod movement. 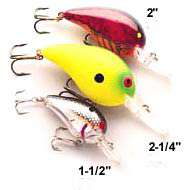 Most jerkbaits have very little or no action when cranked. Jig Simple lure consisting of a single hook with a lead weight moulded around it. Usually dressed with bucktail or, more often these days, a soft plastic grub or worm. Sizes vary from absolutely tiny 1/32oz ultra-lites for any small fish up to several ounces for wreck fishing at sea for cod and ling. Used originally for vertical fishing from boats over deep water. Lipless Crankbait A generic name for vibrating plugs like the Bill Norman "Rattle Trap", "Rattlin' Rapala" and many others. Usually sinkers and always with a very loud rattle. From about 3/4" up to 5". Minnow Long thin plug, usually over 4 times as long as its diameter. In pike fishing "minnow" usually refers to a shallow-diving floating plug that is retrieved with a series of fast twitches and pulls, the technique almost defines which lures are minnows. Mono or monofilament Before braid came along this is the line we all grew up with, nylon or similar single fibre. Stretchy but cheap, principle use for lure anglers now is as a fly leader. The muskellunge, (Esox masquinongy) close relative of the pike, grows bigger and is harder to catch by all accounts, sadly not found in Europe but the premier sport fish in the northern U.S.A. and southern Canada. Many modern improvements in pike fishing techniques and tackle stem from similar developments in muskie fishing, which is why they are important to lure anglers in Europe. They are not pike though, and some effective techniques used for muskie are not so good for pike, it pays to be aware of the differences when reading North American articles and catalogues. Neutral Buoyancy Describing a plug that neither sinks or rises when the retrieve is stopped. Impossible to get exactly right because of variations in weight of leaders, buoyancy of line, density of water at different temperatures, and wear and tear on the plug. Luckily, nearly right is usually fine, allowing the plug to suspend, hardly moving, sometimes very effective for pike. Plug Any solid-bodied lure, usually made of wood or plastic. They come in a bewildering variety of sizes, shapes, colours and actions. Different types include: crankbaits, jerkbaits and minnows. Popper A topwater plug with a dished face that "pops"
noisily against the water surface when twitched. Prop bait A topwater plug that has one or more propeller-type spinning blades mounted at either end or in the middle of its body. These blades rotate and repeatedly splash into the surface of the water as the plug is retrieved. Pull Type of rod movement that pulls the rod tip around from pointing almost directly at the lure, sometimes through 90 degrees, this is a steady movement to move the lure quicker than cranking without pulling it off course like a twitch or a jerk. With a sinking lure this would result in a sink and draw retrieve. Rip Type of rod movement to impart extra action into a lure, a very fast pull. Sink and Draw Simple retrieve pattern where the lure is allowed to sink while the rod is lowered and the line tightened before the rod is raised again to lift the lure. Most often used for spoons, jigs and spinnerbaits. Soft, Soft bait or Soft rubber any lure made from moulded soft rubber. Most often used as jig bodies or trailers. Spinnerbait "V"-shaped, wire-framed lure with a blade or blades on one arm of the "V" and a hook and lead weight on the other, the hook is normally dressed in a skirt of rubber strands, but bucktails are also used. Essential pike lure. Spoon Simple lure consisting of a shaped piece of metal plate and a hook. Huge range of sizes, shapes and colours, for all predatory fish. Stick Bait Topwater plug that had to be worked using a "walk-the-dog" retrieve. This means a short soft pull then a pause, pull, pause etc., this will set the plug zig-zagging across the surface, very effective for summer pike. Stinger An extra hook fixed behind the normal hook on the tail of a lure. Most often seen on spinnerbaits. Swimbait originally a soft-bodied lure with an inbuilt jig head, the Bull Dawg was probably the first, but there are many more available now, Storm produce a huge range. Now also applies to soft- or partly soft-bodied floating or slow-sinking, lures with or without a lip, that appear to have an almost natural sinuous movement when retrieved. Trailer anything attached to the rear hook of a lure used to add attraction or bulk. Most often a soft rubber grub. Twitch A fast but not necessarily violent movement of the rod tip, tightening a slack line to move a lure erratically. Topwater Any lure designed to be fished on the surface. Ultra-lite Using very light-weight tackle and small lures to catch small fish. Irresponsibly promoted by some who catch lots of small pike as a means of making such fishing more exciting. Use with caution. Willowleaf	Type of blade, long for its width with a pointed tip, resembling a willow leaf in shape.